Amidst some blustery and chilly conditions Foxhillfarm Jasper and Foxhillfarm Ivy, from Michael & Melanie Alford, came through a high quality field to sweep the board and win the Limousin Supreme & Reserve Supreme Championships at the 2015 Royal Highland Show. In securing the top honours it is believed that this may be the first time that two homebred animals, and out of the same cow, have won the Champion and Reserve titles at the Royal Highland. The 2015 show is only the second time the Alfords have exhibited in the pedigree Limousin classes and their second Supreme Championship. In 2013 they won the top title with Foxhillfarm Gracie who is also out of Bankdale Alice! Winning a mighty haul of individual awards over the show, and from within a Limousin entry of 118 animals, the Alfords team picked up the Supreme Champion and Reserve; the Male Champion; Junior Male Champion; Female Champion; and the Group of Three titles! Back in May this year, Foxhillfarm Jasper was the Supreme Champion at the Society’s Premier Sale held in Carlisle. 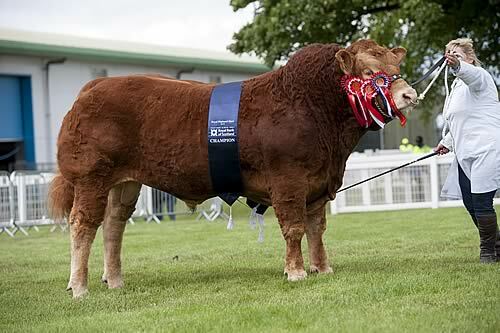 In a unique arrangement at the time of sale the Alfords announced that they had entered, and would show, the bull at the Royal Highland, Great Yorkshire, and Royal Welsh Shows respectively. Thereafter the bull will go to the new owners Messrs Jenkinson, Whinfellpark, Clifton, Penrith, Cumbria who bid to what was the day’s top price of 32,000gns. Between them this summer Foxhillfarm Jasper and Foxhillfarm Ivy have racked up a number of leading awards, Championships and Interbreeds at the Royal Bath & West, Devon County, and Royal Cornwall shows respectively. At the Royal Cornwall the duo paired up to win the blue riband Burke Trophy in front of judge and United Auctions auctioneer David Leggatt. Bankdale Alice was purchased for 15,000gns at the Bankdale Dispersal Sale at Carlisle in July 2011 of Gordon Wilson, Bankdale Farm, Wreay, Carlisle, Cumbria. She has now bred two Royal Highland Show Champions, a Royal Welsh Show Champion, a Great Yorkshire Show Champion, and three Carlisle Sale Champions. In all animals bred by her have so far grossed £284,500! The Reserve Male Championship was won by Ian Nimmo, Bogside Farm, Newmains, Wishaw with the April 2014 born Maraiscote Jura. This young bull who took first prize in his class is by the herd’s prolific stock sire Goldies Comet and is out of Maraiscote Pamela a Tyddn Mei daughter. Remarkably consistent exhibitors at the Royal Highland for the Nimmos between 2010 – 2013 had a run of four Junior Male Championships in a row. Of these three were by Goldies Comet who is also of course the sire of the world record breaking Glenrock Illusion at 125,000gns. It was a Glenrock heifer, shown by first time exhibitor Thomas Illingworth, Howgillside, Eaglesfield, Lockerbie that took the Reserve Female Overall, Junior Female Championship, and Reserve Junior Overall titles. This was in the shape of the very stylish Glenrock Jewel who is January 2014 born and took the first prize in it class for females born on or between 1st January 2014 and 31st March 2014. In so doing it pipped Glenrock Jadore from mum and dad Stephen & Helen, into second place. In 2014 the Illingworth family had held a major sale from the Glenrock herd to help purchase Howgillside after some twenty years of tenancy. Prior to what was the ‘sale of the year’ Stephen and Helen had given Thomas the pick of the heifers from which to start his own herd. Glenrock Jewel looks to have been an astute choice! Glenrock Jewel is by the Irish bred Bremore Artist and is out of the Glenrock herds matriarch cow Glenrock Spangle. Glenrock Jadore, a heifer’s calf, is also by Bremore Artist and is out of another Spangle daughter the noted Glenrock Fantastic. Another remarkable cornerstone female Glenrock Spangle progeny sold to date has grossed just under £400,000! Ian and Wendy Callion, Bolfornought Farm, Stirling enjoyed a fine day’s showing when taking the Reserve Junior Female award along with two first, one second, three thirds, and a sixth place. Winning the Reserve Junior Female award was the September 2013 born Lodge Indie who had won her class for females in calf or maiden born on or between 1st July and 31st December. This heifer is by Loosebeare Fantastic, the same sire as the day’s Champion, and is out of Lodge Evita a daughter of the herd’s noted stock bull Ronick Luke. Indie came to the Highland with a good show record behind her having placed Overall Interbreed Champion at the 2014 Stars of the Future event held at United Auctions in Stirling. Prior to that she had stood first at Perth Show, as well as winning the best 2013 born heifer in the Scottish Limousin Herd competition. The Callion’s other winner came in the shape of Lodge Helena who won the class for females in milk with calf at foot born after 1st January 2012. June 2012 born Lodge Helena is by the Irish bred Ardlea Dan and is out of the Ronick Gains sired Lodge Diana. Winner of the MacGas Trophy for the Best Cow was Burnbank Fortune from D&L Graham, Mains of Burnbank Farm, Blairdrummond. January 2010 born Fortune is by the French bred sire Lino and is out of the Grahams Tycoon sired Burnbank Beauty. The MacGas Trophy is the highest award to date at the Royal Highland show for the Grahams 100 breeding female herd. Come Interbreed time the Limousin entries performed extremely well securing Reserve Overall in the Team of Four and in the Junior Beef competition. The Team of Four comprised of the senior bull Brockhurst Elvis from Doug Mash, Buckinghamshire, Bankdale Elizabeth and Foxhillfarm Ivy from the Alfords, and Glenrock Jewel from Thomas Illingworth. As the Breed Junior Champion Foxhillfarm Jasper represented the Limousins in the Junior Beef Interbreed where he was placed Overall Reserve. In the keenly contested Commercial Cattle section it was a Championship one-two for Limousin sired cattle. Taking the Supreme title was Hugh Dunlop, Holehouse Farm, Ochiltree, Cumnock, Ayrshire with his heifer champion Doolally. May 2014 born this beast is by the 11,000gns Roxburgh Gurkha who was Junior Champion at the Society’s February 2013 sale at Carlisle. Winning the steer championship and taking Reserve Overall was Mr AR Grieve, Lundin Links, Leven, Fife with the October 2013 born Hashtag. This heifer, bred by Gavin Scott, is by Haltcliffe Egidius and is out of a Limousin cross cow.